It's that time of the year again! Jo's Coffee is hosting their 9th Annual Chili Cook Off benefiting the 100 Club. 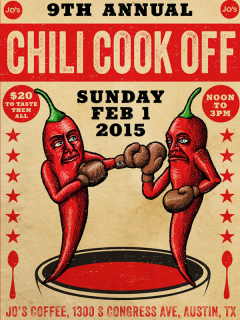 Chili tasting wristbands are $20 and get you a sample of each chili along with one ticket to vote for your favorite. 14 different teams are ready to knock your socks off, including Sway, Yellowbird Hot Sauce, La Condesa and two-time winner Buckeye on the Bayou. Tunes for dancing will be provided by Jeff Hughes & Chapparal and the Jo's House Band. Admission is free; $20 for wristbands.